Allison Kincaid can make a great sales pitch. 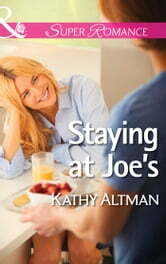 But showing up at Joe Gallahan's motel asking for a favour is her toughest challenge yet. A year ago, they were more than just colleagues at a big PR firm. When work came between them, Joe put the blame on Allison… and his opinion hasn’t changed. She’s shocked, however, when Joe agrees to help. Even though she doesn’t love his terms, she accepts them because she'll get what she needs. If striking a deal with him means donning a pair of coveralls and swinging a hammer, so be it. Working side by side with Joe again, they might be able to repair the past. They just might get a second chance, too!